The U.S. urgently needs new icebreaker ships to patrol the Arctic. Will Trump's border wall get in the way? Coast Guard crews are known for keeping their cool under stress. But when Lt. Samuel Krakower stepped into the engine room of the cutter Polar Star last Jan. 16 — midsummer in Antarctica — the scene was frantic. Icy water was pouring through the hull of the rugged ship, a 42-year-old workhorse on its annual mission to cut a channel through thick ice to the United States’ research hub at McMurdo Station in Antarctica. Twenty gallons of water flooded in every minute, rising toward the feet of the ship’s engineers as they stood on a raised platform, working urgently to seal a leaking shaft between the ship’s propellers that had been knocked loose by a chunk of ice. “Everyone was in panic mode,” Krakower recalled. The crew was able to stop the leak for long enough to apply a sealant to the gap, fashioning a fix in 30 hours that could have taken weeks in dry dock. The narrowly averted disaster is emblematic of the broader dangers facing the Coast Guard’s entire polar mission. The American icebreaker fleet is in a perilous state, with only two operational polar icebreakers. Equipped with strengthened hulls, they are charged with gathering scientific data, rescuing ships stuck in ice and responding to oil spills in the most remote parts of the globe. They also protect U.S. interests in the vast polar regions, where climate change is melting sea ice — opening the Arctic to new commercial opportunities while also raising military tensions. Just one of the two U.S. icebreakers — the Polar Star — can break the thickest ice, and it’s 12 years past its expected end of life. The Coast Guard’s most recent review found that it needs six new icebreakers to fulfill its mission, and that it needs one delivered as soon as possible to replace the Polar Star. It will take years to design and build replacement icebreakers, which will cost billions of dollars. Despite decades of warnings from studies and blunt congressional testimony, and considerable bipartisan political support, progress has been painfully slow. Efforts to grow the icebreaker fleet began under the Obama administration, and, in a rare example of continuity, gained momentum under President Donald Trump, who proposed $750 million for a new ship, which the Senate approved earlier this year. But over the summer, heading into midterms, the House stripped that funding and diverted it to another presidential priority: the construction of a wall along the U.S. border with Mexico. Now, lawmakers returning for a lame-duck session must decide how the money will be spent; Congress has until Dec. 7 to finalize the budget or face a partial government shutdown. 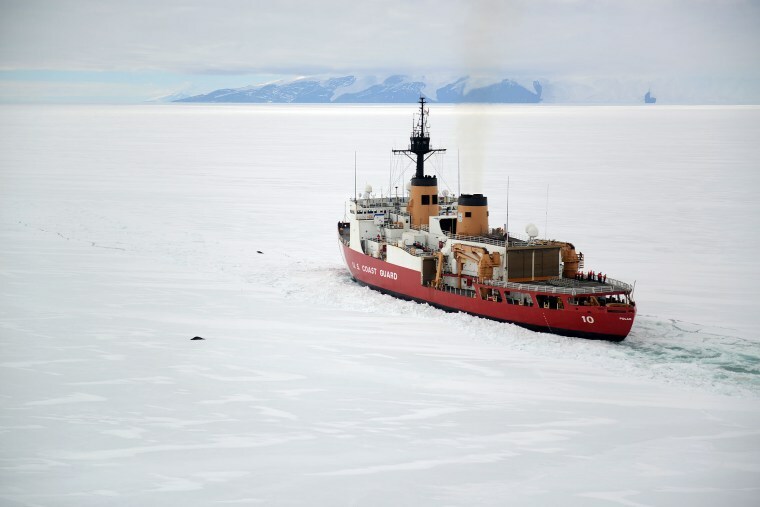 "America's only heavy icebreaker, the Coast Guard Cutter Polar Star, is more than 40 years old and must be replaced by the new Polar Security Cutter," said Vice Admiral Daniel B. Abel, U.S. Coast Guard deputy commandant for operations. "We need the first new Polar Security Cutter immediately to meet America's needs in the Arctic." The White House did not respond to requests for comment. The Trump administration previously released a statement saying it wants both the wall and the icebreaker to receive funding. Experts who have long watched this process are hoping funding for the icebreakers finally comes through, before it’s too late. Even on an optimistic schedule, the earliest a new heavy icebreaker could be in the Antarctic is at least five years from now, and an additional icebreaker for the Arctic would take about 10 years. Russia, in contrast, has invested far more to protect its larger Arctic interests — it has a fleet of about 40 icebreakers and is building more. This year’s close call on the Polar Star was just one of many times in the past decade when the icebreaker could have been lost on its Antarctic mission. Two years earlier, one of the ship’s generators shorted out and began smoking. An engineer used a surfboard repair kit to fashion a replacement part. It was one of four times on that four-month trip that was classified as a “general emergency,” meaning that the crew and ship were in serious danger, according to the Coast Guard. The beating the Polar Star takes on its annual Antarctic voyage keeps it docked much of the rest of the year while engineers repair the damage. The ship withstands enormous pressure as it plows through 6-foot-thick sea ice at a walking pace of 3 mph. That leaves the Healy, a less powerful middleweight icebreaker, to handle the Arctic. It was built in 2000 and is expected to last for another 12 years, but it mostly plays a scientific role, including collecting data on climate change. As the ice disappears, the Arctic is increasingly busy. More ship traffic is pouring into northern shipping routes that are now open for longer periods at the same time that demand for oil and gas is rising. The dissolving ice has become less predictable, raising the risk of ships running aground and spilling oil or stranding cargo, crew and cruise passengers. There are also worries about illegal fishing and smuggling. Even more profoundly, Arctic experts say icebreakers must fill a crucial military gap, bolstering the U.S. presence in a region where nations are jockeying for dominance. It’s one thing to handle a ship running aground, a crisis in which countries would be expected to cooperate. It might be quite another if a rival state decided to encroach on the U.S. exclusive economic zone, which extends 200 miles offshore, or step up a military show of force. The presence — or absence — of an icebreaker could then be a telling message of strength or weakness, according to more than a dozen polar and military experts interviewed for this article. Russia has stepped up its production of polar icebreakers to fulfill President Vladimir Putin’s vision of the Arctic as “the future” of Russia. China, Japan and South Korea are also constructing icebreakers. Should something happen to the Healy while on its Arctic mission, the options are grim. Other allies could help, but the first choice would be sending the Polar Star, which could be thousands of miles away, northward in relief. “We’re the greatest maritime power in the world, and we’re just hoping that a ship built in the `70s can last,” said Heather Conley, a senior vice president focusing on the Arctic at the Center for Strategic and International Studies, a nonprofit policy research group. By 1944, the year of D-Day, the U.S. had built seven icebreakers in a Los Angeles shipyard. Three were lent to the Soviets to break ice across the Arctic Ocean so the U.S. could deliver much-needed supplies. The others were used to support the construction of an airfield in Greenland. These ships would represent the peak of the United States’ ice-breaking prowess, and the biggest fleet in the world. By the time Polar Star and the Polar Sea — both Polar-class heavy icebreakers — were built in the mid-1970s, the WWII-era icebreakers were showing their age. In the mid-1980s, the Coast Guard found that they needed to be replaced and recommended a fleet of four additional icebreakers. A few vocal advocates in Congress — including the delegations from Alaska, Washington and California — raised the issue at every opportunity, but the scales didn’t tilt. That began to change during President Barack Obama’s administration. Alice Hill, who served as senior counsel to the Department of Homeland Security secretary from 2009 to 2013, said “icebreakers were a pretty constant theme” during her time there, but no one knew how to pay for them amid competing priorities. The Obama administration took initial steps toward funding a new icebreaker, culminating in $175 million in the 2017 budget. But that wasn't enough to begin designing and building a type of ship that hasn’t been constructed in the United States for more than 40 years. When Trump released the first budget proposal of his presidency in March 2017, it included a major boost to defense spending, with one notable exception: a $1.3 billion cut to the Coast Guard to fund a wall along the border between the U.S. and Mexico. Congress ultimately restored the Coast Guard’s funding, and Trump has more recently telegraphed support for the Coast Guard. In particular, Trump has praised its response to hurricanes, though he has baffled some by referring repeatedly over the past year to the Coast Guard “brand” and how it’s improving. “There’s no brand that’s gone up like the Coast Guard over the last couple of years because of what you’ve done with the hurricanes in this country,” Trump said last month in a Thanksgiving teleconference with the military. Trump spoke in support of new icebreakers in a May 2017 address to the graduating class of the Coast Guard Academy. “Out of the five branches of our armed services, it’s only the Coast Guard that has the power to break through 21 feet of rock-solid Arctic ice, right? … You’re the only ones. And I’m proud to say that under my administration, as you just heard, we will be building the first new heavy icebreakers the United States has seen in over 40 years. We’re going to build many of them,” Trump told the crowd to applause. When the Trump administration released its request for the fiscal year 2019 budget, it included $750 million for the construction of a new icebreaker. The Senate approved the funds — only for the House to divert them to the border wall. The House’s decision was motivated more by a desire to fund the wall ahead of the midterms than a desire to defund the icebreaker, according to people who have been following the issue. Even if the funding is included in the next budget, the U.S. faces a possible three-year gap during which there would be no heavy icebreaker, according to a recent report by the Government Accountability Office. And if the funding doesn’t come through, it could send a message to the industry that the U.S. is not serious about replacing and expanding the icebreaker fleet, which Rep. Garamendi said could be a death-blow to the whole program.